Learning to Sail... What's stopping You? 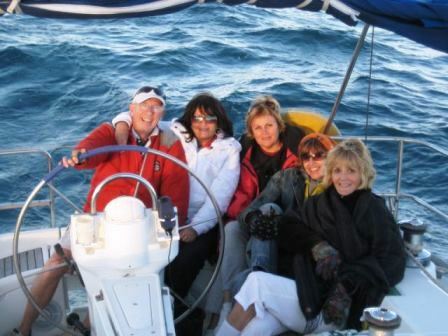 People are less seasick on sailing yachts than on motor boats. The keel and sails act as stabilizers so the yacht does not roll in the same way. Sickness is much easier to prevent than to cure so if you think you are susceptible, investigate preventatives including tablets, patches, and armbands. Learning to sail on yachts are not like dinghies. They are designed so that they do not capsize. When you sail towards the wind they will sail at an angle ('heeled over') but this is quite safe. You should make sure that you are comfortable and well supported in the cockpit as this will give you confidence. You may need to experiment with different places to sit to find the best one for you. Sailing schools normally run group courses for up to five students. Although these may be strangers at the start of the week you will quickly find that learning together creates a bond. It is very unusual for there to be friction on a sailing course even though you are living in a small space. Sharing a common experience seems to help enable people to get on well even if they are very different. Most small yachts are not particularly comfortable. They are designed for sailing performance rather than for spacious interiors. Marine toilets are not the nicest things to use either! Don't be discouraged. 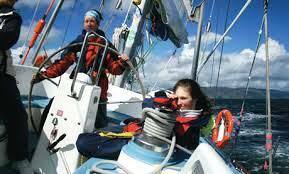 Most people have no difficulty adapting to living on board for the five days of an RYA sailing course. If you think of learning to sail as going camping on water you will find that you are pleasantly surprised as yachts are more comfortable than tents! The weather in the UK is unpredictable. 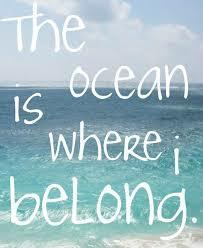 If this concerns you why not start sailing in a warm climate such as Spain or Greece? You will get sunshine most of the year and for your first course it makes no difference whether you learn in tidal or non-tidal waters. Investigate the likely wind and weather conditions in the areas you are interested in and make an informed choice. You can learn to sail at any age. You may find you are less confident and not as strong as in your youth but one of the wonderful things about sailing is that you can continue to sail into your 90s! Most schools will be happy to take older students but you may need to look around a little for insurance if you are over 70. 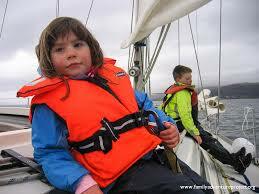 There are sailing schools that will happily take families with children. A warm climate is often an advantage as children prefer shorter passages with lots of swimming stops. 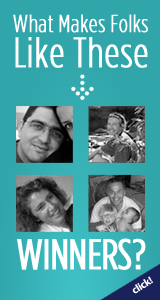 Find a school that has experience with families and discuss it with them. The cost of learning to sail is a major inhibiting factor for many. While it is not a cheap sport it's possible to start sailing on a budget. Many schools offer discounts out of the main summer season, or for last minute bookings. You can also ask at local clubs if anyone would be prepared to take you on as crew. Don't let any of these factors deter you from learning to sail - you'll never know if you'll enjoy sailing unless you try it! This is an RYA recognised training centre based on the pretty island of Aegina. Although not as well-known as some Greek islands, Aegina (pronounced Ayina) is one of the closest islands to Athens and has an interesting history and a unique charm. Aegean Sailing School have been offering RYA sailing courses to an international clientele since 2005 and are well known for their friendly, professional service. The school runs a full range of RYA sailing and theory courses throughout the year, and also offers powerboat courses and skippered sailing holidays.